We are a group of Tankers from all walks of life and all ages. The passion we bring to the game, and the desire to increase our skill and make Tanktastic a better place is what makes our clan special. We might not have all of the high ranker's that some of the other clans do, but everyone deserves to be a part of something. Join HAWK for a fun experience, and a chance to enjoy the clan wars in Tanktastic. 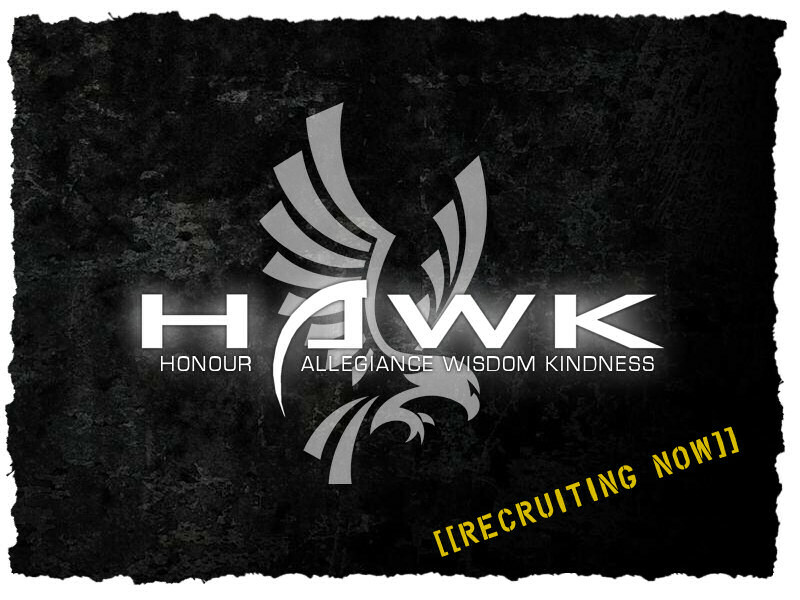 This clan values: Honour, Allegiance, Wisdom and Kindness, Hence HAWK. Honour - Respect those who battle us, be courteous in victory and defeat. Allegiance - Support the clan and it's members. Do not treat members unfairly or aggressively. Help those in need. Wisdom - Use your head. Learn techniques to improve your overall performance. Abide by the rules of TankTastic. Kindness - Help those in need. Treat those as you would like to be treated. HAWK was created in May 2014 by Xpreatorian, the clan has seen many updates and revisions to the game. HAWK has a long history in Tanktastic dating back to the early alpha versions of the game. The clan has been (and still is) home to many moderators in the game. We have several members who are also moderators of the Official Tanktastic Forum and also administrators of the Tanktastic Wiki. DigitalCrow took over leadership of the clan from September 2015 - April 2016, Xpreatorian has now returned to his rightful place as leader of the clan. We ask that all members read and abide by these rules before or after joining the clan. Fair Play - We ask that our members play fairly and attack other clan-mates in open deathmatch games and avoid teaming unless it is a team game. Booster will be immediately dismissed from the clan and banned from the game! To be accepted, you must be able to speak English, be online regularly and contribute to the Clan. We are not a clan but a family. We focus more on personality than experience, so join now! All members get to have the clan logo on their signature and communicate with the clan on our clan forum. We recommend members join the Tanktastic Forum and VK Group. Anyways, great job digital, I feel proud of how far you have come. I'm so glad to have been with HAWK since that day in may... it's been my first clan ever, and will stay my forever. I luv this clan so much and those within it. Great statement Crow! HAWK is the League of Gentlemen (and women) of Tanktastic. As long as i am in tanktastic, HAWK will always be my home clan. Thanks for accepting me into the clan. I was pleasantly surprised to see a lot of familiar names in the roster! Welcome in HAWK Tiger! It's the League of Gentlemen and I presume you will fit in very well. I wish you lots of ingame fun and pleasure. Can someone pm me the password for the private topic? Really nice, mate. I like it very much. Welcome to the forum, Psalm71! Welcome to our clan and to the TT forum, Psalm71. Boosting is the act of speeding up the process of gaining credits and experience through unfair ways, by using methods that are not supported by the game developers and the community. These methods include, but are not limited to, any given user having one of his friends joining the opposite team then letting said user kill them multiple times in order for them to gain experience and credits at a much faster rate than normal.